Khawaja, Cummins and Patterson have joined the Thunder squad for this game. The league phase of the Big Bash League (BBL) has come to its business end with only very few matches left before the knockouts begin. The fourth spot is still up for grabs with Melbourne Stars going down against the Brisbane Heat to spice things up. Stars though still have their fate in their own hands and will have to win the last league game against the second-placed Sydney Sixers. Sydney Thunder, however, are themselves to blame for this situation. They were sitting pretty in the top three a few matches ago and were looking to set to go through. But they botched up the situation by losing three of their last four matches. The Brisbane Heat, along with themselves have kept the Thunder alive in the tournament by beating the Stars but regardless of the result of this match, both the teams will need the Stars to lose their final game. 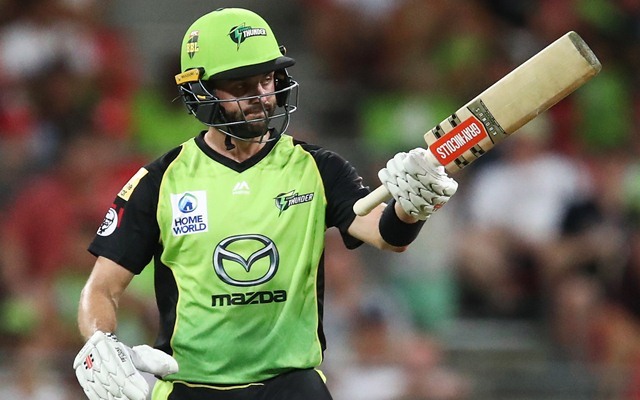 Also, the net run-rate comes into play for the one of the Thunder and Heat to qualify but their fate entirely depends on the Melbourne Stars’ last league game. The Thunder should look to win big after a thumping 10-wicket win for the Heat against the Stars. Hobart Hurricanes, on the other hand, have nothing much to worry about. They have played like the champions throughout the season so far and looked a class apart. They are at the top of the points table with 10 wins under their belt and would be looking to go into the semi-finals with some momentum. The Manuka Oval in Canberra hosted the third match of the season which was affected by rain with the DLS method coming into play. The Thunder had won that game though and a flat pitch might be on offer. The same venue hosted its first Test match recently between Australia and Sri Lanka and the hosts raked runs for fun. The temperatures will hover in the late 10s and this time there are no chances of rain. The Thunder have been boosted with the return of the Test trio Usman Khawaja, Pat Cummins and Kurtis Patterson. These three will surely play while the presence of Shane Watson makes the batting look extremely strong. Also, Cummins will be playing his first game of the season and will strengthen the bowling attack. There will be a lot of changes in the team for this match as Jay Lenton is also injured and Matt Gilkes has been named in the 13-man squad. Probable XI: Shane Watson (c), Usman Khawaja, Callum Ferguson, Anton Devcich, Kurtis Patterson, Matt Gilkes (wk), Chris Green, Pat Cummins, Fawad Ahmed, Chris Jordan, Gurinder Sandhu. Hobart Hurricanes have named an unchanged squad for this game. James Faulkner has been rested ahead of the semi-finals which allows him more healing time for his injured knee. The same team might play with the skipper Wade and D’Arcy Short opening the innings. Caleb Jewell has been a great find for them at number three with the McDermott, George Bailey and Simon Milenko to follow. The bowling attack is also looking really good for the Hurricanes with Jofra Archer and Riley Meredith leading the way. Qais Ahmed’s signing makes the bowling look more threatening now with Clive Rose also in the side. Probable XI: Matthew Wade (c & wk), D’Arcy Short, Caleb Jewell, Ben McDermott, George Bailey, Simon Milenko/Alex Doolan, Jofra Archer, Clive Rose, Qais Ahmed, David Moody, Riley Meredith. 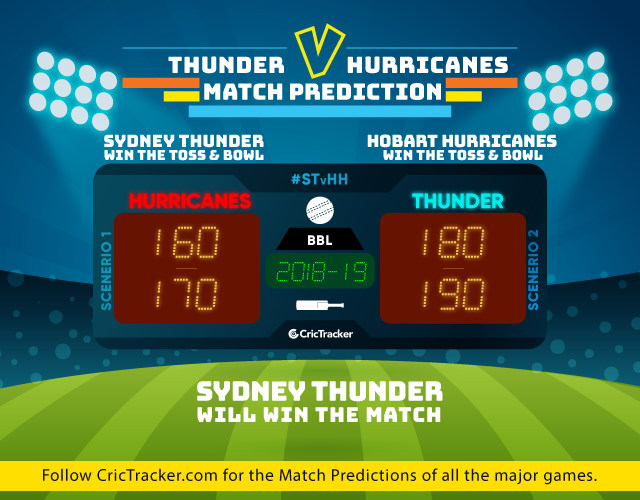 The prediction is for the Thunder to get better of the Hurricanes in their last league game.